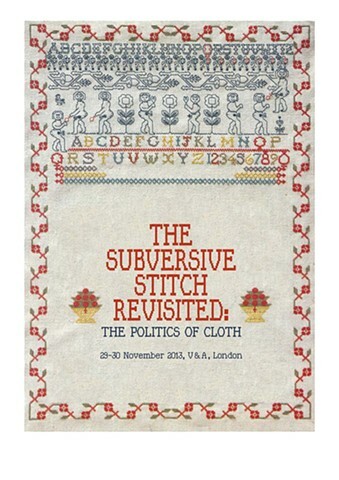 Presented at the The Subversive Stitch Revisited: The Politics of Cloth, Victoria and Albert Museum, London, UK, 2013. This paper explores sewing as a form of resistance in the work of artist, activist, garment worker, and educator Carole Frances Lung, also known as Frau Fiber. Lung creates participatory sewing performances and actions, emphasizing skills sharing and instruction in an effort to provide an alternative to the abuses of the global garment industry. Lungs sewing projects belong to a larger historical trajectory of subversive stitching that includes domestic sewing, activism in the suffragette and labor movements, and traditional sewing circles and quilting bees. This text connects Lung's ouevre to the legacy of subversive stitching  as theorized by Rozsika Parker and the curators of the 1988 Subversive Stitch exhibitions  to contemporary iterations of subversive sewing that include social and participatory projects by artists, and to feminist, anti-globalization, labor, and grassroots community organizing.